The Auto Marketing Blog: Toyota What the--?! There are some things I just do not get. Perhaps it's more about turning 40 years old in about a month or the fact that I haven't read a comic book in 25 years? Whatever the reason, the latest co-branding content marketing concept from Toyota makes no sense to me and in fact leaves a painful grating sound in my ears that is sure to annoy me for the next hour. 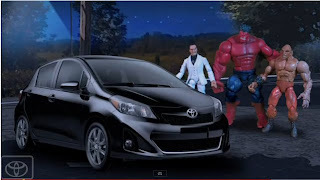 What I'm talking about is a video content collaboration between the Toyota Yaris and Marvel's What the--?! which is Marvel's self parody comic book. Perhaps that is what's so annoying about the content. It is self-deprecating parody from the comic book company instead of someone else mocking them. Add the self-mockery with some automotive brand advertising and you get something quite odd. Leaving one YouTube watcher to state the obvious: "I like these but kinda weird.﻿"
So what do you think? Are you a fan of Marvel's What the--!? and I'm not the target here so I'm missing what's cool about this? This seems like a Robot Chicken Spoof. I agree what is going on. but then it is a Yaris. I mean who came up with that name. Kind of long and painful. Yes, it's weird. But as an avid [current] reader of comics, it's really damn funny.